The most reliable and largest Homeopathic Repertory is now available as an App! The Synthesis App is based on the Synthesis Repertory edition 2009, published by Dr. Frederik Schroyens. Synthesis is used worldwide and is known to be the most comprehensive & most reliable repertory. Send the clipboard via email to your RadarOpus program, to analyze, compare remedies, check the VES (Vithoulkas Expert System) results, and save to your patient file. Although the Synthesis App can be used as a completely independent App, you also have the possibility to use it as a companion to RadarOpus! You can send the clipboard via email to your RadarOpus program to continue the analysis, compare remedies, check the VES (Vithoulkas Expert System) results and save to your patient file. This functionality makes the Synthesis App a true companion to RadarOpus! Synthesis is renown as the repertory with the most reliable source referencing. 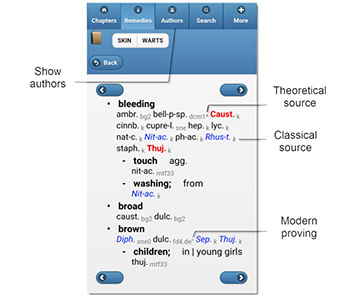 The Synthesis App does contain that same source referencing, be it in a concise format to save space on the screen. The Synthesis App is slightly different compared to the RadarOpus software. It does contain all remedies entries (all additions) and all rubrics, including some veterinary rubrics *, however it only contains one author reference per remedy. If a remedy was present in Kent's repertory you see a "k". If not, then the most original available reference is mentioned, starting from Hahnemann: "h". This is not a scientific division, but rather a pragmatic one for the Synthesis App. To see more precise reference information regarding all additions in the repertory, we refer to the RadarOpus software. There you will be able to view all source references (the App only shows one author reference per addition). RadarOpus software allows the user full control over which sources are shown in the repertory at any given time (Repertory Views). Below, you will find screenshot examples of the Synthesis App. These screenshots cover only some of the features. These are English Synthesis App screenshots. The Synthesis App is also available in other languages. These screenshots are taken with an Android Smartphone but the Synthesis App runs on all mobile platforms! On other platforms, the layout looks very similar. Swipe to the chapter you want and tap to select. Or type a few characters to find the chapter quickly in the list. From the list of main rubrics swipe, or type a few characters to find it. Then select it with a tap, or tap the blue arrow icon to go that main rubric. The repertory window shows all rubrics with remedies. You can also see the original source of the remedies by selecting to show the authors. With a search on a word (or part of a word) you can find anything in the repertory, even if it is hidden in a sub-level. You can search for a combination of two or more words (or parts of words). The word-search result shows all symptoms found throughout the whole repertory. Tap a symptom to jump to that symptom in the repertory. A tap on a rubric allows you to take it into the symptom clipboard or to bookmark it for later reference. 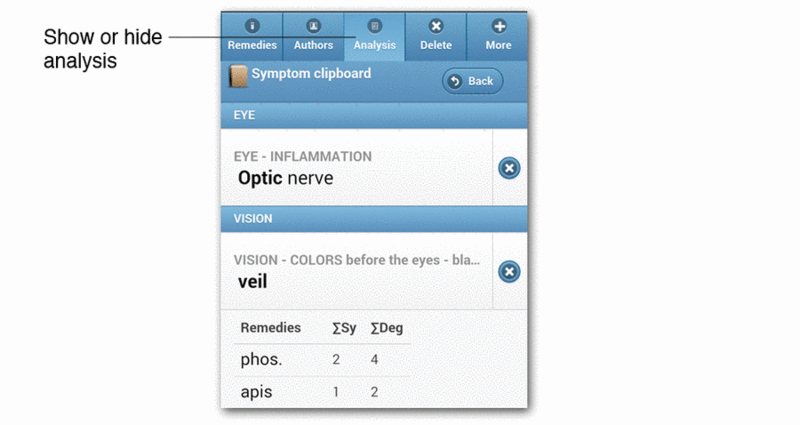 The symptom clipboard can show the selected symptoms with or without remedies/authors. 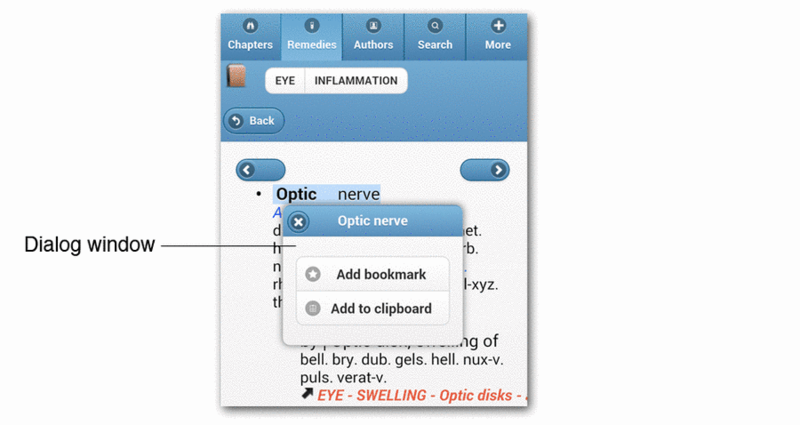 View the analysis for the symptoms you have taken into the clipboard. Browse, Find, Search, Clipboard and Analysis, Export, The symptom path, The Repertory Tab, Bookmarks. What does the Synthesis App contain? Can I use the Synthesis App on more than one device? On which mobile devices does the Synthesis App work? What are the minimum requirements for the Synthesis App? Can I test the Synthesis App before I decide to buy it? In what languages is the synthesis app available? Who can download and use this App? Where can I download the demo (Lite) or full version? I am a veterinary homeopath, is this App for me? Is there a cheaper version for developing countries? You can install and evaluate the demo (lite) version on as many devices as you like. The license agreement permits the user to install the App on two personal devices on the same platform, for example an iPad and an iPhone. If you wish to use the app on a new device, you will need to uninstall the App from one of the other devices. After the App has been uninstalled, contact support and mention which device you are no longer using. Support will deactivate this device and you will be able to install the App on your new device. If however you also have a mobile device with a different platform (for example a Windows 8 Phone from the Windows store), then you will need to purchase the Synthesis App again for that platform type. The Synthesis App has been developed for all mobile platforms and will run on most devices if the minimal technical requirements are met. A one time download via Wi-Fi or phone network is required for the installation of the Synthesis App. After that, the Synthesis Apps will work without Wi-Fi or phone network connection. Only if you want to use the Synthesis App as companion to RadarOpus and send the Clipboard with or without Analysis to your Email will you need an Internet connection via Wi-Fi or phone network. Yes, you can try out the Synthesis App by downloading the demo (lite) version. There is no time limit on the demo (lite) version! It is fully functional except for the export to RadarOpus and contains two chapters ("Eye" and "Vision") while the full version contains all 41 chapters. Although the App can be downloaded by anybody, it is an application specifically created for homeopathic practitioners or students. Hence, it is not suitable for the general public. You will need some homeopathic training in order to know how to use the homeopathic repertory effectively. Both the demo (Lite) and full versions can only be downloaded from the Android/Apple/Windows App Stores. You can find the direct download links in the View, try & buy section. Yes, you can use this app in the same way as you would use the Synthesis repertory book. You also have the benefit of additional veterinary * rubrics, and what is more - it is always at hand wherever you are! The user has to buy the Synthesis App at the Google Play store or the iTunes store, as both stores request full control. Neither Zeus Soft nor its dealers can sell the Synthesis App directly. Consequently the user has to pay the official price to the App stores. Zeus Soft has only chosen a price category in one currency and one country. The App stores then use a table (pricing matrix) defining the price for other countries and other currencies. Neither Zeus Soft nor its dealers have control on the prices of the Synthesis App in different countries. Therefore Synthesis App prices vary from one country to another and from one currency to another if converted according to bank exchange rates. Zeus Soft can only decide one price category for the App worldwide. The App stores then decide about the price in all countries, using their price matrix (see previous FAQ). This is the policy they apply for all products and the reason why an iPhone is not much cheaper in India than in the USA. Zeus Soft has to comply with that policy. Here you find the most recent version of the Synthesis App Manuals. For any questions not answered, contact your local representative or support. We are happy to provide support to all our registered users, so please have your connector number at hand. The quickest way to get a reply to your question may well be to contact your national representative as he/she lives in your country and may be aware more than anyone of your needs. If your local representative doesn't provide support, please open a new Support Ticket. 4.2 Information that we collect may be transferred to the following countries which do not have data protection laws equivalent to those in force in the European Economic Area: (the United States of America). 6.3 All information transferred from your device to our server are encrypted and authenticated using the secure https protocol. 7.1 This application is owned and operated by Zeus-Soft - VAT: BE0647 962 374.